FAIRLEY GILLIS, K. & HIBARD AYER, S., Boreal Ties Photographs and two diaries of 1901 Peary Relief Expedition, Albuquerque 2002. Hard cover 23 x 24,5 cm. 232 pages illustrated with around 100 photographs..
"In 1899 Robert Peary, exploring northern Greenland in search of the North Pole, lost seven toes to frostbite but refused to cut his exploration short to seek treatment. When his wife learned of his condition, she and their seven-year-old daughter set off in July 1900 to find Peary and persuade him to come home. The 1901 expedition documented in this fascinating new book was organized to deliver supplies to Peary and to search for his wife and child. The book comprises the annotated diaries and photographs of two participants in the expedition, Clarence Wyckoff and Louis Bement, close friends from Ithaca, New York who paid to join the voyage." CHRISTIE's, Exploration and Travel, London 1997. Auction catalogue[10 April 1997 / no. 5773]. Soft cover 26,5 x 21 cm.149 pages with 134 lots. Lot 51: Everest expeditions 1923/24. Christie's, Exploration and Travel, london 1998. Sales catalogue 8 April 1998. Soft cover 26,5 x 21 cm. 186 pages with 191 lots. Christie's, Exploration and Travel, London 1997. Sales Catalogue 26 september 1997[Sale 5854]. Soft cover 26,5 x 21 cm. 157 pages with 153 lots. Some removable pencil marks. Christie's, Exploration and Travel, London 1998. Sales catalogue 17 September 1998. Soft cover 26,5 x 21 cm. 221 pages with 215 lots. Some notations in removable pencil. CHRISTIE's, Exploration and Travel, Londen 1999. Auction catalogue 17 September 1999 [sale: 6188]. Soft cover 26,5 x 21 cm. 314 pages with 279 lots. HEYERDAHL, T. a.o., Great Norwegian Expeditions, Oslo 1950's. Hard cover 27 x 20 cm 232 pages with around 75 photographs. Cover some wear. Good copy. This book details Norwegian voyages of discovery in ancient times, Fridtjof Nansen, Otto Sverdrup, Roald Amundsen, Aircraft in Polar Exploration, the Kon-Tiki expedition and exploration in recent times. HEMPLEMAN-ADAMS, D. a.o., The Heart of the Great Alone. Scott Shackleton and Antartic photography, New York 2009(publisher: Bloomsbury // ISBN: 978-1-60819-007-2). Hard cover 24 x 28 cm. 256 pages with 104 photographs. "This exhibition of remarkable Antarctic photography by Herbert George Ponting and Frank Hurley marks the 100th anniversary of Captain Scott’s ill-fated journey to the South Pole. Ponting’s extraordinary images record Scott’s Terra Nova expedition of 1910-13, which led to the tragic death of five of the team on their return from the South Pole. Hurley’s dramatic icescapes were taken during Ernest Shackleton’s Polar expedition on Endurance in 1914-16, which ended with the heroic sea journey from Elephant Island to South Georgia. Presented to King George V and today part of the Royal Photograph Collection, these sets of photographs are among the finest examples of the artists’ works in existence. Captain Robert Falcon Scott (1868-1912) set sail for Antarctica on Terra Nova in 1910, determined to be the first to reach the South Pole. His team included Herbert Ponting (1870-1935), the first official photographer to participate in a polar expedition. Ponting was already a well-known and successful travel photographer when he was introduced to Scott in 1909. As the ship sailed south from New Zealand, Ponting began work immediately, recording the first icebergs encountered in December 1910 and scenes on board. He photographed as much as possible during his time in Antarctica, producing around 2,000 glass plate negatives between December 1910 and March 1912. A selection of his spectacular pictures of the landscape, the expedition crew, and wildlife including seals, gulls and penguins, is included in the exhibition." WILSON, D.M., The lost photographs of Captain Scott. Unseen images from the legendary Antarctic expedition, New York 2011(publisher: Little, Brown and Company // ISBN 978-0-316-17850-1). Hard cover 26 x 28,5 cm. 190 pages with 122 photographs. "Captain Scott perished with four of his fellow explorers while returning from the South Pole in March 1912. Until now, the legend of the fatal expedition has been based on diaries and sketches and the celebrated photographs of the expedition's professional photographer, Herbert Ponting. What has not been recognised is that the principal visual record intended to be left to posterity was provided by Scott himself through his own photography. These photographs were fought over, neglected and then lost for more than half a century. Now they can be seen in a new book by the great-nephew of expedition party member Dr Edward Wilson." 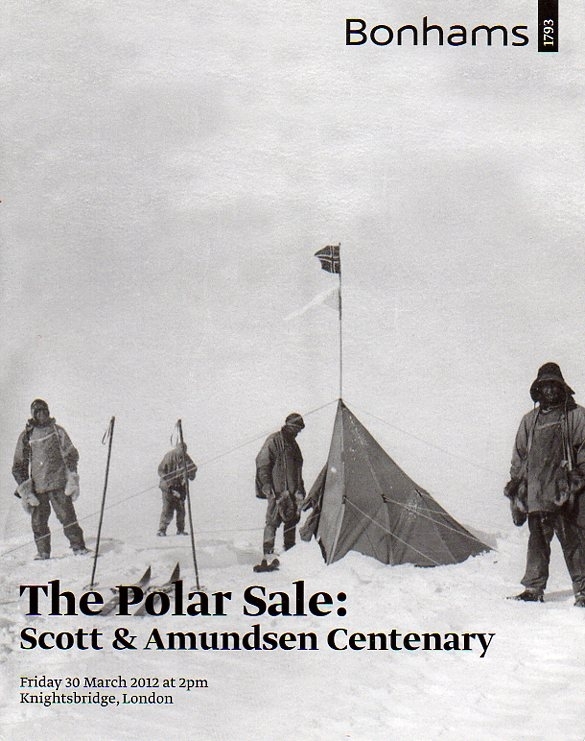 BONHAMs, The Polar Sale Scott & Amundsen Centenary, London 2012. Sales catalogue March 30, 2012[Sale: 19552]. Soft cover 21 x 26,5 cm. 172 pages with 222 lots. Index and price list. BONHAMs, Polar II Scott & Amundsen Centenary, London 2012. Sales catalogue December 4, 2012[Sale: 19952]. Soft cover 21 x 26,5 cm. 77 pages with 136 lots. Index and price list. HUNTFORD, R., The Shackleton Voyages. 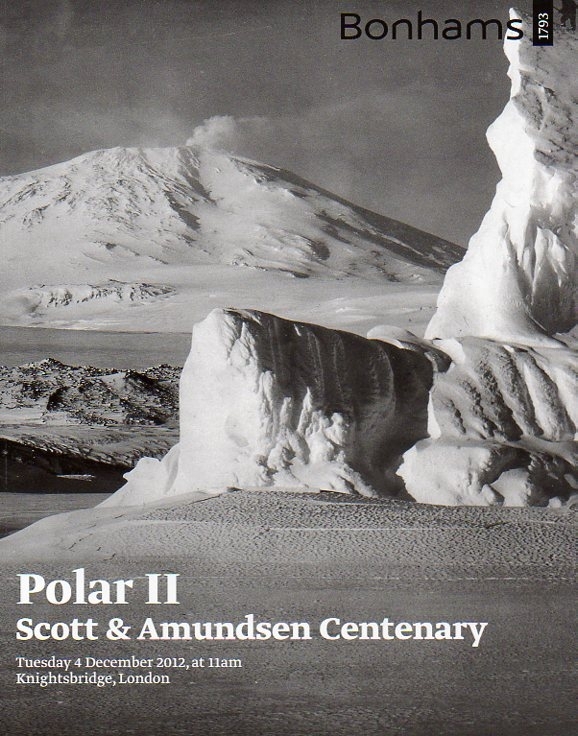 A Pictorial anthology of the Polar explorer and Edwardian hero, London 2002(publ. : Weidenfeld & Nicolson / ISBN: 0297843168). Hard cover 30 27 cm. 287 pages with around 200 photographs.